Eskandari, K., Ghourchian, H., Banaei, A. (2017). Electrochemical Behavior of Adult and Fetal Hemoglobin at Gold-coated Magnetic Iron Oxide Nanoparticle. Journal of Applied Biotechnology Reports, 4(3), 669-674. Khadijeh Eskandari; Hedayatollah Ghourchian; Aghdas Banaei. "Electrochemical Behavior of Adult and Fetal Hemoglobin at Gold-coated Magnetic Iron Oxide Nanoparticle". 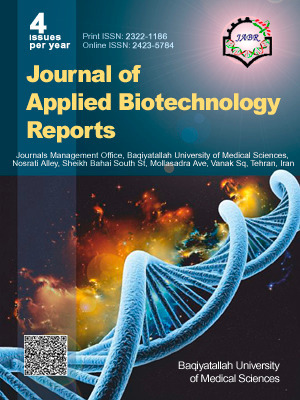 Journal of Applied Biotechnology Reports, 4, 3, 2017, 669-674. Eskandari, K., Ghourchian, H., Banaei, A. (2017). 'Electrochemical Behavior of Adult and Fetal Hemoglobin at Gold-coated Magnetic Iron Oxide Nanoparticle', Journal of Applied Biotechnology Reports, 4(3), pp. 669-674. Eskandari, K., Ghourchian, H., Banaei, A. Electrochemical Behavior of Adult and Fetal Hemoglobin at Gold-coated Magnetic Iron Oxide Nanoparticle. Journal of Applied Biotechnology Reports, 2017; 4(3): 669-674. A feasible and fast method for Adult Hemoglobin (A-Hb) and Fetal Hemoglobin (F-Hb) study was developed by immobilization of Hb on gold-coated magnetic iron oxide nanoparticles (GMNPs).The prepared GMNPs composite nanoparticles with 60 nm diameter were used as a carrier for the immobilization of Hb. The A-Hb and F-Hb were physically attached to the GMNPs nanoparticles. The direct electroche- mistry of F-Hb and A-Hb showed a quasi-reversible cyclic voltammogram corres- ponding to the Heme group with a formal potential of 314 and -334 mV in 0.1M PBS (pH 6.2), respectively. The apparent charge transfer rate constant (ks) and transfer coefficient (α) for electron transfer between the electrode surface and pro- tein were calculated as 0.29/s and 0.1 for F-Hb and 0.21/s and 0.47 for A-Hb. The linear concentration rangesare17.3–225 and 7.4-53 mM for F-H band A-Hb biosensors for H O detection. The lifetime of biosensor is more than 2 weeks.